The collisions (occurring in different galaxy pairs) are seen in different stages of the merger process show the sequence that occurs. In (a) and (b), the galaxies are still separated, but huge tidal forces of gravity are already pulling stars from the galaxies into enormous broad fans that stretch hundreds of thousands of light-years in space. In (c) and (d) the colliding galaxies have merged into single, larger galaxies. The violent past of these galaxies can be inferred from the tidal "debris" that still surrounds the newly formed galaxies. There's room in theuniverse for thousands of galaxies but that doesn't stop them from running intoeach other. New observations support the idea that galaxies are in constantinteraction with each other and that the biggest ones get bigger by engulfing smallerones. These observations confirma long-standing theory about how the universe works ingeneral and sheds light on how things got started in the first place. "This is the way thateverything in the universe was formed," said Pieter van Dokkum of Yale University. "It's a never-ending storyof things colliding--small things colliding to make big things, big thingscolliding to make bigger things. These are the events that shape today'sgalaxies." The theory goes like this:The universe was a fairly smooth place following the Big Bang, but there werelittle bits of substructure material that attracted matter and began to grow.As time passed, these clumps grew bigger and bigger. Through gravitationalforces, the bigger ones began attracting some of the smaller clumps, collided,and merged with them, forming what we know as galaxies today. Although this logic seemedreasonable to many scientists, they didn't have much evidence that these largebodies actually interacted with each other. Confusing the matter, the mostmassive galaxies also appear to be the oldest, which would have left verylittle time since the Big Bang for them to form via mergers. 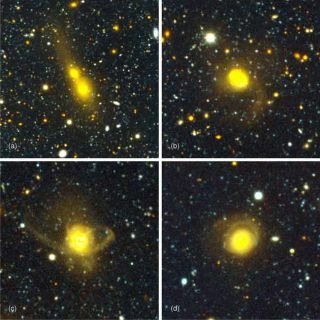 Now, van Dokkum's multiple deep-field observations--taken with theNational Science Foundation's 4-meter telescopes at KittPeak National Observatory and Cerro TololoInter-American Observatory--display the telltale signs of inter-galacticinteractions. Van Dokkumselected 126 nearby red galaxies, chosen because of their massive size, andbegan searching for signs of gravitational influence from outside sources, suchas tails, broad fans of trailing stars, or other obvious asymmetries. Althoughthese features are faint, they turned out to be quite common, showing up in 53percent of the galaxies. "It shows that thesegalaxies are not in equilibrium, that something is pulling stars out of thesegalaxies," van Dokkum told SPACE.com. "On this scale the only thing we know of that can do this is anothergalaxy, and we can actually see that." These observations alsoshow that these merges happen fast--which is probably why they were difficult tospot before now. "Well, fast is a fewhundred million years. That's fast compared to the age of the universe,"van Dokkum said. While that doesn't seem very fast,it's quick enough to account for those old, massive galaxies. This research, which isdetailed in the Dec. issue of Astrophysical Journal, also helps solvethe long-standing problem for judging a galaxy's age. Previously, astronomersequated the age of stars with the age of the galaxy, even though sometimes thegalaxies appeared much younger than the stars. "We have found that,though their stars are generally old, the galaxies that result from thesemergers are relatively young," van Dokkum said. Galaxies smashing into oneanother sounds like an explosive event. On the contrary, they probably slidetogether smoothly, generating little fanfare. Galaxies are mostly empty space,and the distance between stars is so huge that the probability of starscolliding is actually very small. There is still a chance fora violent explosion though, especially if the central black holes of the merging galaxies collide and merge. "This event could be sopowerful that it could cause ripples in space time," said van Dokkum. But collisions like thesesurprisingly spark very little, if any, new star formation. One possible reasonis that the galaxy has already used up all its gas forming the stars alreadythere. "Or, at a previouspoint the central black hole created so much energy that it pushed the gas outof these galaxies," van Dokkum said. "Thatis what's next on the agenda to figure out." It doesn't appear that theMilky Way has a collision rich history, van Dokkumsaid, mainly because it has a very large, intact disc that a merge or collisionwould have disrupted. But that could change soon-- the Andromeda galaxy M31 lurks just 2.3 million light yearsaway and is on a crash course for the Milky Way. "The Milky Way willcollide in the future, in about 4 billion years with the galaxy Andromeda andthat collision will lead to formation of a much bigger galaxy," van Dokkum said. "So we have that to look forwardto."